In today’s fast paced, emotionally disconnected world many of us find ourselves building up emotional, physical and mental anxiety, stress and pain. We have little time to look after our bodies with exercise and good nutrition, we fill our brains with useless information and violence, emotionally we often feel drained and stressed. For well being, our Body, Mind and Soul need to be balanced and if one area is overburdened the others will be affected too! Often emotional, mental or spiritual problems will lead to physical ailments. Healing Sessions are much like a massage only that they work much deeper and therefore also end up ‘massaging’ your mind and soul. They can relieve pain and acute problems very quickly and by healing the physical it also affects the emotional, mental and spiritual levels which often cause physical ailments in the first place. Sessions will also revitalize anyone suffering from emotional or mental stress, anxiety and they have often helped stop addictions. Physical: Eye problems, allergies (eczema/psoriasis), headaches/migraines, flu, toothache, low blood circulation, infections, back pain, menses irregularity/pain, bronchitis, asthma, gall stones, diabetes, body detox, sprains, broken bones etc. Emotional/Mental: Stress, depression, anger, anxiety, insomnia, shock, addictions etc. I began working with healing 25years ago when I completed a 6month Devine Healing Course which included Acupressure, Acupuncture, Touch for Health, Chi Gong, Thai Chi, and the use of herbs for health. Afterwards I finished a Prenatal Healing course which taught me to use pressure points on the medulla, feet, hands and ears to release childhood-, womb- and past- life traumas. Furthermore I have taken groups which taught me to work with, and teach others how to use, crystals, metals and pendulum, and how to make ayurvedic crystal waters. 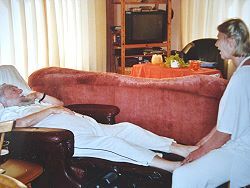 I took several massage courses and partly worked with Tibetan Healing. Throughout this time I learnt how to teach different meditation techniques. In an Ashram in Pune I led Sufi Whirling and Primal groups. I also did Tarot readings in the Mystery School. When my Guru in Pune, Osho, left his body I was invited to come live in Lucknow with Papaji (Poonjaji), an Advaita Vendanta Master. I was blessed by His presence and Satsangs for 5 years. Here I also learnt Feng Shui and Jin Shin Jyutsu from one of His disciples. Papaji often called me for healings, although I noticed that in fact He did healings on me while my hands lay on Him. Much empowerment happened in silences. 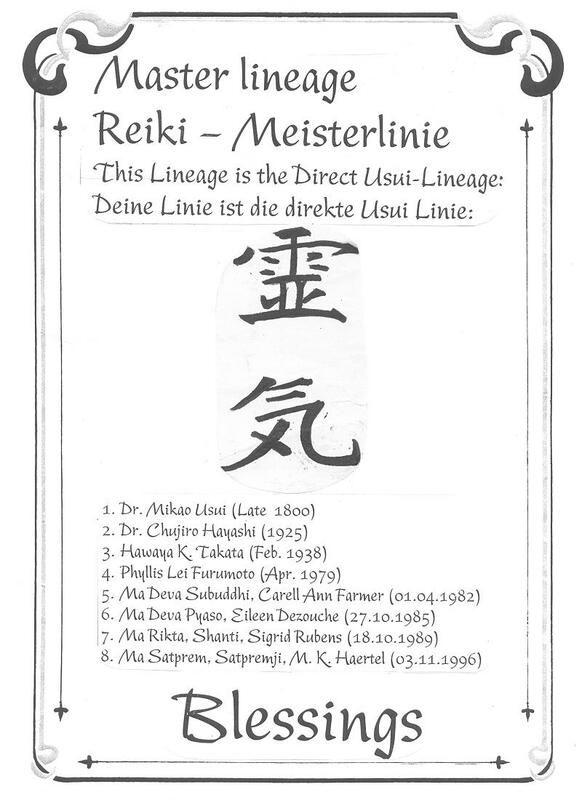 Shortly before He left His body He encouraged me to be initiated into Reiki by one of His disciples who was a Reiki Master-Teacher in 6th lineage of Master Usui. Through my experience with different healing techniques and traditional Reiki, I have developed “my” own healing art which has become very successful and strong. I combine the use of Universal Life Energy, Touch for Health, Crystals, Shamanism and breathing techniques to heal any imbalances in the physical body. Basicly the "I" steps aside and healing energy is channeled through me. Mind and Soul too receive healing. What is manifested in the body always has its components in the mind, emotions and on spiritual levels. A Whole-istic Healing Session using “my” own developed healing art takes 2 ½ hour. Hypnosis works on a subconscious level and facilitates healing from within. It helps end addictions, depression and psychological ailments and also can influence positively physical illnesses. It can raise ones abilities in any given field and help achieve personal goals. I learnt Hypnosis over 15 years ago and use it for myself in many day to day situations. The amount of sessions that need to be given I find out with the help of my pendulum. Then the client and I create together the wished affirmations. Mostly 21 sessions of 30 minutes each are needed for successful results. 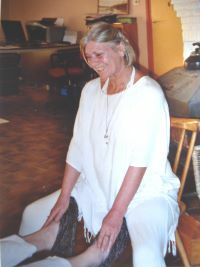 Whenever my students need healing or any empowerment, but are unable to come and see me in person because they are in a different city or country, they send the address they are staying at and I channel and send them distance healing while they do a breathing technique I teach. It happens that students or clients have family or friends who have had an accident, or have fallen ill, even lay dying and they ask me to send distance healing or strength. After such distance healings we exchange what has happened during the time at the other end and for me. It always synchronizes. It is still each time an amazing experience, to see that it works. I certainly feel grateful and blessed. For people which never worked with me, they can connect me over email to agree upon a distance healing. Feel free to contact me on my email satpremji@yahoo.de.